With mistletoes and pine cones. Causing a tin angel to swing wildly in the balcony. As the wind from the Vale of Hell whips them. A snow storm in the Schwarzwald. With chocolate and roasted nuts on top. Tea and Linzertorte are served in the warm Stube. Anise, brown sugar and cinnamon-sticks. And apple-pudding to go with it. 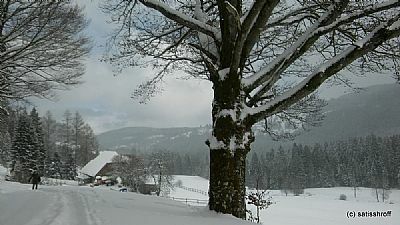 Is winter idyll in the Schwarzwald. Winter in the old days meant austerity and poverty. Today it’s tourism throughout the year.